Grumpyface Studios: Wispin Out Now on App Store! 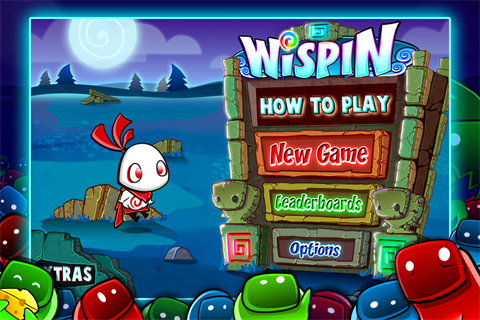 Wispin Out Now on App Store! Get it while it's hot!! Thanks so much for the support everyone, and we hope you enjoy the game! New Portland-based Independent Developer, Grumpyface Studios, in Association with Blackmouth Studios, today launched their inaugural title for Apple’s iPhone and iPod Touch. “Wispin” offers an unprecedented new game experience by combining traditional color-matching gameplay with the Action/Arcade genre. Packed with features, the title boasts two endless gameplay modes, customizable play controls including “Tilt” or “Virtual Joystick” options, an in-depth playable tutorial to help ease new players into the game, special bonuses and powerups that mix up gameplay, Color Blindess Support, Left Handed support, and beautiful HD cartoon graphics that make great use of Apple’s new Retina Display. 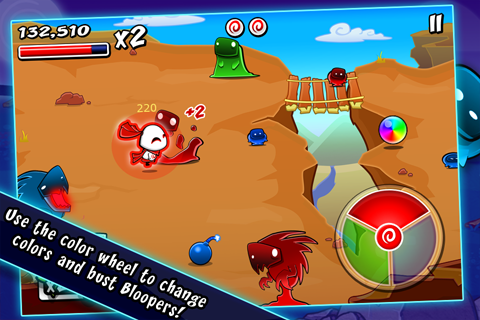 By tilting the device (or using the virtual joystick option, if they so choose) players take control of the spunky Wispin, who must fight off the infestation of his colorful world by strange (yet undeniably cute) creatures known as Bloopers. These pests come in a variety of distinct colors and can only be dispatched with matching color-coded magical attacks. 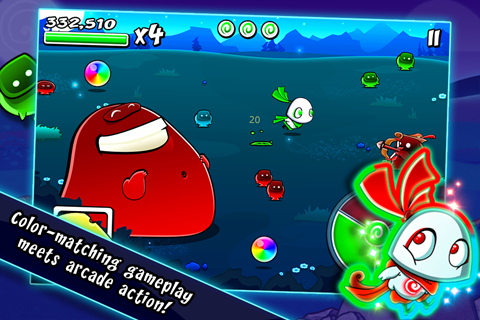 Luckily, Wispin is armed with the unique ability to change the color of his form, which players will accomplish by manipulating the innovative “Touch Color Wheel” controls. Appearing similar to a traditional “virtual joystick”, players will slide their thumbs over the wheel’s colored sections to turn Wispin red, green, or blue on the fly. Care must be taken, however, as Wispin will find himself susceptible to enemies and attacks that do not match his current color. 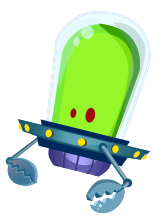 Special items are available to help Wispin face the Blooper infestation, including bombs, bows, multi-colored rainbow attacks, and even delicious pieces of cheese that draw in and trap enemies. 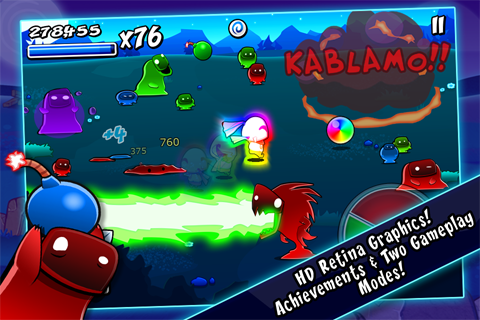 Players will also experience a unique arcade-styled “multiplier/combo system” that is triggered by matching streaks of same-colored enemies. 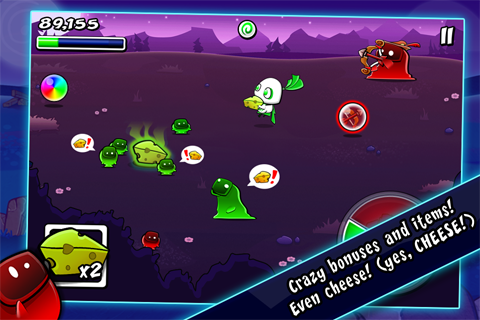 Two gameplay modes are available: “Standard Mode”, which allows players of all skill-levels to progress through the game as it slowly escalates and grows more challenging over time, and the unlockable, survival-based “Super Intense Mode” that features quick “pick up and play” action as Bloopers immediately fill the screen and endlessly assault Wispin. Players will be able to compare their scores on the worldwide “Game Center” enabled Leaderboards, and also work toward unlocking over 15 creative and challenging Achievements. I sent a request to appadvice to review this game. I hope it helps you success and promotion of this game. Soooooo glad this finally came out :D Love the game! Wispin Update 1.0.1 Now Available! Wispin Hands-On Impressions at TouchArcade.com!